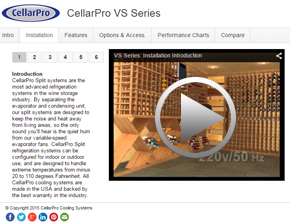 For each series of CellarPro cooling units, we've created an interactive demo guide to help you select, install, and modify a refrigeration system for your space. Our most compact and popular cooling units, 1800 Series self-contained units arrive fully charged and ready to install out of the box. 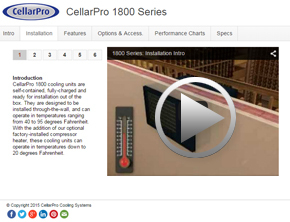 More efficient and quieter than similar systems from competing brands, 1800 Series cooling units are best suited for wine cabinets and small wine cellars up to 400 cubic feet. By separating the evaporator from the condensing unit, our split systems keep noise and heat away from living areas. Our split systems offer 2 configuration options, can work indoors or outdoors, and should be installed by a HVAC/R professional. 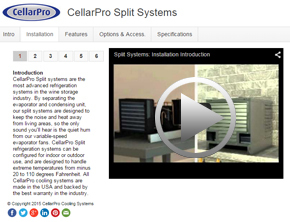 Designed for cellars up to 2,000 cubic feet. VS Series cooling units are designed to handle cellars up to 2,200 cubic feet and engineered to provide maximum performance in temperatures up to 115°F. These self-contained units come fully charged and are ready to install out of the box. The VS Series is extremely versatile, with indoor and outdoor configurations, and can be ducted up to 100 feet. 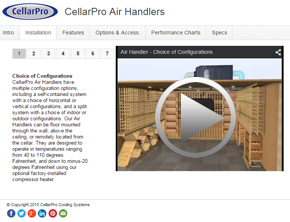 The most complex and powerful series of CellarPro units, our Air Handlers serve cellars as large as 15,000 cubic feet. A qualified technician should perform the installation, whether the unit is floor-mounted through the wall, above the ceiling, or located outside of the cellar.